You’ve been planning your dream home for years, probably since you were a child. Over the years you’ve refined your plans based on the direction your life has taken. And now, you are ready to make that dream a reality. For your dream home to have all of the luxuries and amenities you have always wanted, hire a custom home builder. From choosing your lot all the way to the finishing touch, a custom builder will be there every step of the way, making sure you are satisfied. R&K Custom Homes designs and builds new homes in Greensboro that will be sure to meet all of your expectations. The first step in custom home building is choosing a lot. R&K Custom Homes builds in many different neighborhoods so you have a variety of choices. Do you prefer a social environment with neighbors close by? Or a more private wooded lot in a natural setting? Do you prefer a flat lot or one with some hills? Whatever type of lot you’re looking for, R&K Custom Homes can build new homes in Greensboro neighborhoods that will meet your criteria. When it comes to choosing a neighborhood, consider proximity to shopping, restaurants, schools, and businesses. Choosing the right neighborhood is part of what makes your dream home great. One of the best parts of having a custom home built is choosing features. You are not limited to a small selection of predesigned floor plans as with some builders. Your house will not look like every other house on your street, it will be unique. You can have vaulted ceilings, a home theater, state of the art kitchen, elaborate patio space or screened in porch, a fun playroom for the kids, and much more. Tell your builder everything you want, no matter how extravagant. You may be surprised by what is possible. R & K Custom Homes has the expertise to turn your ideas into reality. A custom-built home will reflect your own personal style. Colors, floors, windows, lighting, hardware—all will be exactly as you choose. 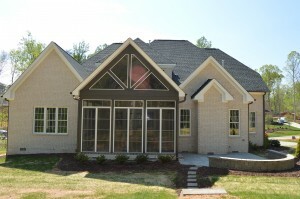 R & K Custom Homes installs top of the line brands of interior products in Greensboro new homes. Durable and luxurious, your interior will continue to impress for years to come. One of the best parts about custom-built new homes in Greensboro: there’s no work for you before moving in. No repainting, no cleaning, no repairs as may be necessary with a preexisting home.